The Place: Jane Pickens Theater in Newport is currently showing Love & Friendship, a film adaptation of Jane Austen’s novella Lady Susan. It stars Kate Beckinsdale and Chloë Sevigny, both wearing an enviable wardrobe throughout. The Plot: Lady Susan Vernon is a scandalous and scheming socialite who is an expert at camouflaging her diminishing fortune. Destitute and dabbling in multiple dalliances, she assumes the role as matchmaker for her daughter Frederica–and herself. Hilarity ensues. The Skinny: Whether you’re a certified Janite or a casual appreciator of well-written, fast-paced satirical snark, you’ll enjoy this sassy charmer. The Bevvies: The Pickens is the only theater town serving up craft cocktails, so while you can opt for atrusty Mojito or Dark n’ Stormy, consider one of their specials like the Pom Fresco (vodka, cucumber, pomegranate, Prosecco and fresh lemon), Jane Pickens (gin, Pimm’s, lavender and fresh lime), Gotham City (barrel aged Manhattan), Selma (tequila, habanero, cilantro, grapefruit and fresh lime) or the Sailor’s Cider (Newport’s own Thomas Tew Rum with cider). Me? I chose a simple split of Prosecco. Cheers! Love & Friendship now playing through June 9. Angela Moore Fashion Show & Champagne Brunch: Tickets Selling Fast! If you want to enjoy one of the staples of the summer social season, now is the time to make sure you have your Angela Moore Fashion Show & Champagne Brunch tickets in hand as the event sells out every year! The show will include fun resort fashions featuring new looks from Angela Moore, Manuel Canovas, Just Madras and Jack Rogers. The doors will open at 9 a.m. Guests are invited to have their picture taken on the “Red Carpet” staircase of Rosecliff and then enjoy cocktails on the terrace, overlooking majestic views of the Atlantic Ocean, before proceeding to the ballroom for the seated Fashion Show and Brunch. To purchase tickets online, visit www.newportmansions.org or call 401-847-1000 ext 140. All proceeds from the event will benefit the Preservation Society. 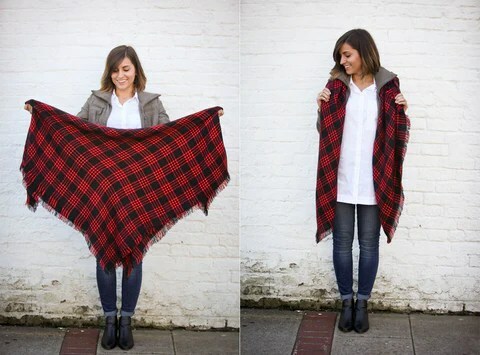 I don’t have any conclusive evidence, but I’d venture to say that the blanket scarf may just have been the most popular stocking stuffer this Christmas. (Let’s just say I was standing in a TSA security line over the holidays with more than one outfit twin, right down to the tartan pattern.) 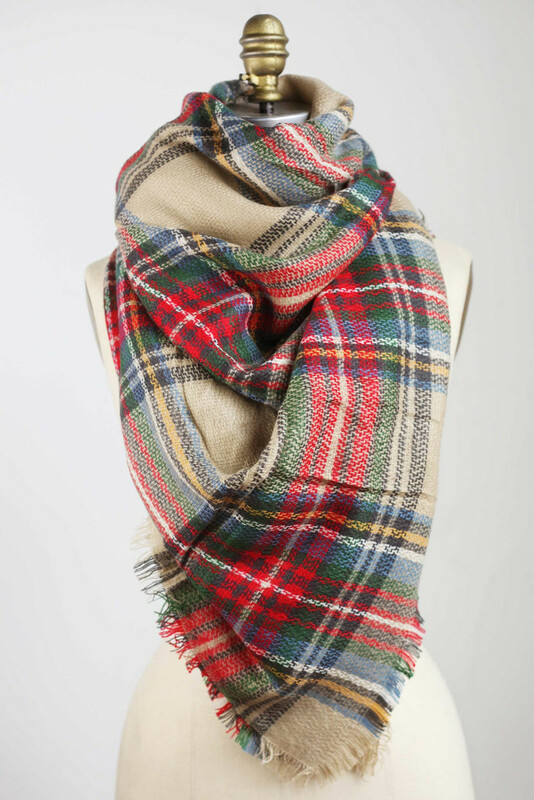 Plaid, plush and perfectly positioned to be a fashion accessory and a functional winter warming layer, the blanket scarf isn’t going anywhere soon. Hold the fabric by the corners and fold into a loose triangle. Wrap around your neck, letting the point of the triangle serve as a centerpiece. Tuck in the edges. Adjust front of scarf to lay flat. 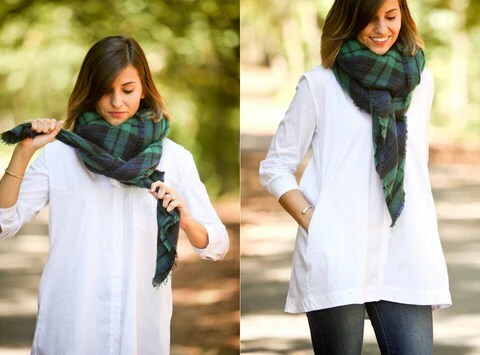 Best worn with: The oversized white button-up shirt or a simple tee. Start with a loose triangle fold. 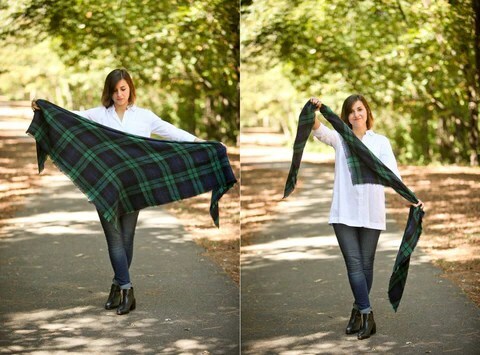 Center the shawl on the back of your neck then wrap forward over your shoulders. Hold the edges firmly with one hand, while you slide a thin belt behind you and buckle the scarf into place. Best worn with: A simple dress or a long top with skinny jeans or leggings. 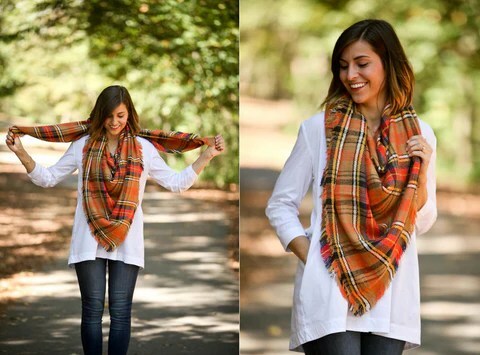 Loosely roll the scarf up into one long piece. 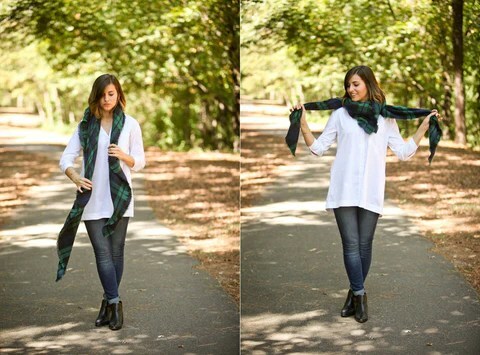 Pop your collar and tuck the scarf underneath. Let it hang low and add long lines to your ensemble. Best worn with: A collared jacket that falls at the waist or a long peacoat. Loosely roll the scarf lengthwise. 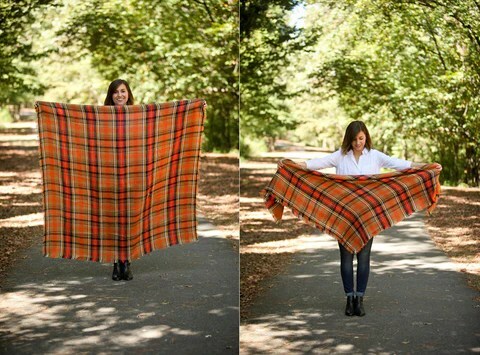 Center it behind your neck, then loosely wrap around once. Bring the ends around to the front of your neck and secure them in a loose knot. Best worn with: Something dressy-casual like a shirtdress or a skirt and top. You’ll find these super soft accessories around Newport or shop all scarves from Bourbon & Boots by CLICKING HERE. Maybe it’s from my many years spent living below the Mason Dixon (or from being a member of The Bourbon Club at Old Glory in Georgetown which requires experiencing the over 80 varieties on site in one year) but I love this site. They had me at the Thelma & Louise whiskey glasses. There are countless reasons why fall is the favorite season of so many. Crisp breezes, apple picking in the orchard and hot cider (with just a splash of spiced rum) are just a few seasonal temptations. 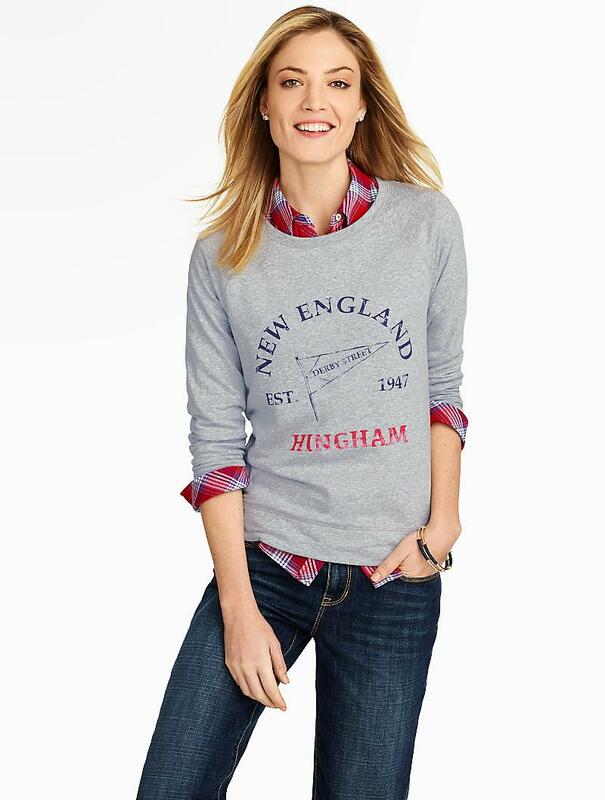 So are my new style finds that invite you to embrace the warmth of the season. 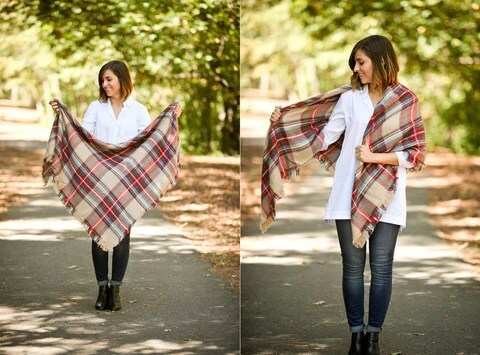 You’ll find five of my favorite fall must haves right now (like the blanket scarf below) on The Daily Basics — CLICK HERE!